Back home in Boston, my mom is training to run Rás na hÉireann USA, a really fun, local Irish-American 5K race. Every year the race fills to capacity, and in mid-March (obviously), streets close down and are filled with rivers of shamrocks and leprechauns and flags. I ran it years ago – to date, the only 5K I’ve run – and it was so much fun. The medals that the race organizers gave out at the end of it were Celtic knot-covered bottle openers on a long green ribbon, and all the local Irish pubs were free for an hour for the runners. Too bad I wasn’t yet 21 at the time. Hearing that my mom is working hard to get a satisfying experience out of the upcoming run (as well as my obsession with a food/running/lifestyle blog called Daily Garnish) inspired me to put on the old runners and go for a jog around my new neighborhood this morning. I have a lofty goal to run races around Ireland this year – I think it would be a really great way to see different parts of the country. When I lived in Dublin for university, I was a coxswain for Trinity’s rowing team. Training took up all my weekends and holidays, so I didn’t end up doing much sightseeing. I did get to do some traveling with the team to different cities to row in regattas, meaning that my only experience in some places, like Cork and Belfast, are limited to the rivers. Which is a cool way of seeing a place for sure, but fairly limiting. One of my favorite things to do in Ireland is go on hours-long country and coastal walks – I want to challenge myself to run as well as stroll. Alas, I am going to have to put in some work before that can happen in any way that is remotely comfortable. Being unemployed (more about that in a future post) has given me the curse of having too much free time, which has just made my productivity level plummet. It has been a very couch-potato week, lounging around my new house (which I am definitely growing to love now that it’s clean! ), job searching, and reaping the benefits of Channel 4’s On Demand website. Not great for fitness. The plan is to join a gym once I have some sort of income; I am one of those unfortunate people who prefers running on a treadmill to running outside. I just feel more in control and I can push myself much, much further: I’ll happily run for 40 minutes on the machine, but outside I feel overwhelmed and spent after about five. I’ve been in Dublin for six weeks though now – about time to get back into some kind of fitness routine! I did try to go for two runs when I first arrived back in January, but both times it began to horizontally snow/sleet into my face as soon as I left the house, so that didn’t continue for very long. I can’t wait any longer for the funds for gym membership, and you have to start somewhere. It was a sunny morning (we’ve had a great week or so weather-wise, haven’t we, Dubliners?) when I started out. I know the neighborhoods north, south, and west of where I live fairly well, but had never wandered eastwards. And it turned out to be beautiful! Big brick houses with ornate windows and doorways, an enormous stone church that I started to tiptoe into and then got cold feet and backed out, neat little gardens, and babies being pushed in carriages. It’s such a privilege to discover new little pockets of this city that I pretend to know so well. I alternately jogged and ambled, and it was a great way both to start the day and to get more at home in Dublin. Also, it made me feel justified to eat a truly enormous breakfast when I got back. Hopefully this is the first of many runs that will eventually branch out to 5Ks and maybe even 10Ks around the country. 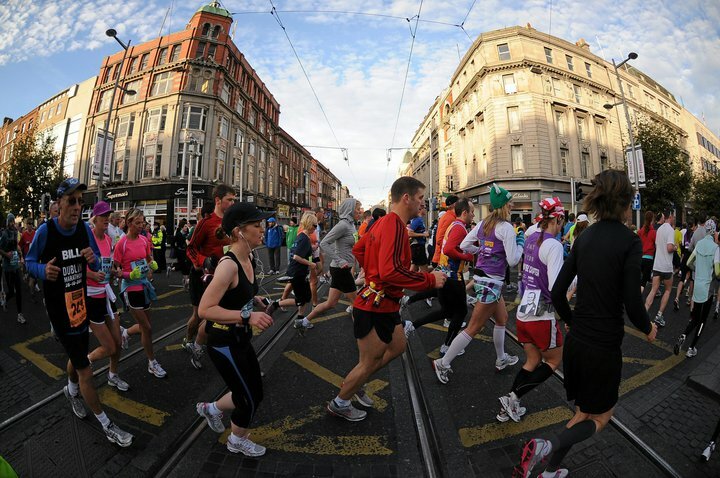 If you read this and you’re a runner here in Ireland, I’d love suggestions for good races with great atmosphere and scenery. There was a supplement in the Irish Times a few weeks ago about taking up running. It detailed proper posture and technique, stretching routines, injury prevention, and gave one of those “couch to 5k” training programs. Folks, that’s gonna be me!